questions or are not satisfied. Our shop is always trying to solve the problem. ?HIGH QUALITY:Made of the polyester net cloth material, dense small mesh holes, effectively isolate mosquito, improve sleep quality. Not easy to break, long using life. ?PORTABLE FOLDABLE:Portable Foldable: Foldable baby mosquito net is easy to open and more convenient to entry and exit without noise. You can also move this mosquito net bed cover at any time. ?MULTIFUNCTION NET: This portable mosquito net can not only resist mosquitoes, but also can be used as a protective mesh screen food cover tent umbrella without affecting the taste. ?PACKAGE CONTENT:1 x Baby Bed Net Tent. Size: 90cm*120cm(LxWxH). 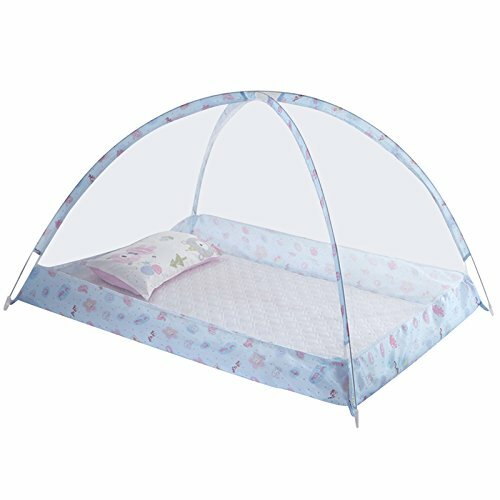 Suitable for 0-3 years ?SATISFACTION GUARANTEE: If there were any questions with the Baby Crib Tent. Please do not hesitate to contact us, we will give you the best service.